The Latvian airline airBaltic will transfer two of its new Airbus A220 aircraft to its base in Tallinn next year to better service its growing network of air transport. "Since 2014, we have systematically been increasing our presence at Tallinn Airport and we are very pleased that an increasing number of residents of Estonia are using airBaltic. By next summer, we will be offering direct flights from Tallinn Airport to 12 destinations. By basing our third airplane in the capital of Estonia, we reaffirm our commitment to the local market. 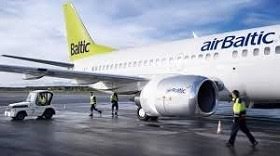 Our vision of airBaltic is that of a genuine trans-Baltic aviation company and Estonia will definitely be a part of our story of growth," said Martin Gauss, CEO of airBaltic. With the transfer of two airplanes, a total of three airBaltic aircraft will be located in Tallinn. This year, the company intends to transport a total of 400,000 passengers via Estonia, which makes Tallinn the second biggest market in the Baltics after Riga in terms of volume of operations. airBaltic currently offers direct flights from Tallinn to Amsterdam, Berlin, London, Oslo, Paris, Stockholm, Vienna and Vilnius, as well as connecting flights through Riga. In 2019, direct flights from Tallinn to Malaga, Brussels and Copenhagen will also be launched.